Kitchens Are Monkey Business: "Just Ask Rosie" And My Friend Ange In WI Did. or ask me to show them how to prepare a particular dish. asking for my take on braised short ribs. because this meal was most excellent. First, let's have a chat about short ribs. Beef Short Ribs can be cut from three different sections of beef. The most common short rib cut is the Back Rib (NAMP 124) which comes from the thick side of the prime rib. A second source, called Plate Short Ribs (NAMP 123 series), is found in the plate primal, which is found in the animal's forequarter right below the rib primal. 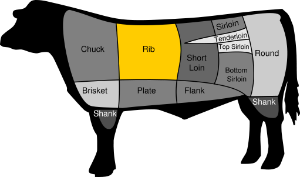 The last are called Chuck Short Ribs (NAMP 130) which come from right under the chuck from the first to the fifth rib, and can also go by the name Flanken Ribs. NAMP is the National Association of Meat Purveyors and the number refers to a specific cut of the cow. NAMP numbers are the same as the IMPS numbers (Institutional Meat Purchase Specifications) which can be found in this Meat-Buyers Guide. For clarification, here's a poster showing beef cuts. about the different types of short ribs. As I said, the NAMP number refers to a specific cut of meat. which particular cut he wants by referring to the number. In the supermarket, it's a whole different ball game. is rarely identified on supermarket labels. but they are more tender. lots of meat in addition to a lot of fat. The chuck short ribs are tougher and less fatty. But I can make them pull-apart tender. I'm doing boneless chuck short ribs - NAMP 130.
and it actually said "chuck" on the label. making these muscles full of connective tissue and sinew. so it won't be tough. to make this tough cut tender and delicious. then grill it hot as in Korean Kalbi. simmering it low and slow, covered, in a flavorful broth. that holds the meat to the bone. adding flavor and moisture to the meat. Wait a minute, make that five ways. for up to 72 hours. I want to eat the same day. My preferred method of short ribs is braising. all on a creamy, cheesy, buttery bed of polenta. If you're using dried, only use maybe 2 bay leaves. Prepare veggies: finely dice carrots, celery, turnip, onion. Mince garlic. Salt and pepper meat. Dredge meat through flour, shaking off excess. Cook the pancetta in a Dutch oven over medium heat. When golden, remove from pan and drain on paper towels. Reserve for later. Turn heat to medium high, adding more oil if you think necessary. I used an additional tablespoon of peanut oil. Place short ribs in hot oil one at a time. Sear each side. Add in prepared vegetables and stir for a couple of minutes. Pour in 2 cans of beef broth, scraping up any goodie bits on the bottom of the pan. This is where the flavor is. Pour in the wine. Add the tied bundle of herbs, cover, and place in oven. After 2 1/2 hours, add the reserved pancetta to the pan. In this last thirty minutes, prepare the polenta. Recipe forthcoming. You want a large enough pan so you do not crowd the pan. Too much food in the pan dissipates the heat, causing the food to steam, rather than saute or sear. When you add the meat, leave it alone. Do not fuss over it. Resist the temptation to poke, push, and/or turn. Do not move the meat. The meat will let you know when it's ready. If you try and move the meat before the side has been properly seared, it will stick and you'll tear the meat if you force it. Wait and shake the pan. If the meat releases, it's ready to be turned. Sear short ribs on all sides. You have six sides to these cubes. Don't miss one. In the case of meat, dry-heat cooking, whether roasting with dry air in the oven or with heat conducted directly from a hot pan, results in the formation of a flavorful crust on the surface of the meat. Browning and flavor development are the result of a chemical process called the Maillard reaction. This culinary phenomenon occurs when proteins in meats are heated to temperatures above 310 degrees, causing them to brown. This is similar to the process of caramelization, where carbohydrates, like sugar, turn brown when heated. Searing creates an attractive brown crust on the surface of the meat, that enhances both appearance and flavor. Searing, or browning, is the prelude to braising. Moist-heat cooking methods, such as simmering or braising can't generate as much heat to form this crust, since water boils at 212 degrees. That's why we sear the meat first - to brown it and to develop the Maillard flavors. Now we want to braise it, to cook and tenderize it and let the flavors develop even more. Onion, celery, carrots, turnips, garlic. I like a fine dice on my veggies. you want meat with nice marbling in it. and has a beneficial effect on juiciness, flavor, and tenderness. Lightly season the meat with freshly ground salt and pepper. some rosemary, and bay leaves. so it can be easily fished out after cooking. Fry up the diced pancetta. because pancetta has a milder flavor. You get the pork flavor, without bacon's smokiness. Most American bacon is smoked. in salt and spices, then dried. Dredge short ribs in flour. Sear on all six sides. Cook a couple of minutes, stirring. Sometimes I use canned broth. I am not a food snob. Add in a nice cabernet sauvignon. Sometimes I drink wine from a box. I prefer "wine from a box"
rather than "wine from a bladder." Add in the fresh herb bundle. Cook at 350 degrees for 2 1/2 hours. Edited to add: NotMuchOfACook caught me here. for the last 30 minutes. You won't believe how good my house smells right now. And start on the polenta. Bring turkey consomme to a boil. Add in cream and bring to a boil. slowly so no clumps form. until thickened, about 30 minutes. Stir in butter and cheeses. and saved the remaining two cups for moreovers. I prefer the extra flavor provided by a good stock. You could bring both to a boil at the same time. Remove short ribs from oven. And serve over the polenta. all combine to create a synergy of complexity. The total is greater than the sum of its parts. It's cold and gray and rainy and nor'easterly outside. There's a fire in the fireplace. I think you're gonna like this. And I'm already thinking about short rib moreovers. My favorite dinner of all--short ribs over polenta. It looks fabulous. I have a question: why don't you finish your short ribs in the oven in your dutch oven? And, do you cover your short ribs during their time in the oven? Oh, thanks NMOAC. I'll have to go back in and explain that. I did finish everything in the Dutch oven. The liquid had cooked down and reduced, so I transferred everything to a smaller baking dish for serving and storage in fridge. Yes, SweetPhyl, it was covered. And that reduction was delicious. I bet it was and I daresay you could bottle it and sell it as cologne. Men would go WILD! and women, too, for that matter! SweetPhyl, I love cooking with red wine. It smells wonderful. Sometimes I actually pour it on the food. I make my short ribs in the slow cooker. It's the perfect vessel for this cut of beef. After cooking all day, the short ribs are falling off the bone good. Thank you so much. Our recipes are almost identical. I served mine over my creamy mashed taters instead of polenta - but that's only because I didn't feel like going to the store to get polenta! LOL. Awesome job and I'm so glad you enjoyed my challenge. Ange, all you need for polenta is cornmeal. Thanks, and I'm always up for a challenge.